new to me motorcycle... came with bike light!! in the one picture? I can make out the model number, so, that’s the one… has the pouch battery and everything. previous owner? this is an old street trail bike, 6v system… headlight sucked back in those days? he got a bicycle light so he had as he put it “something resembling a headlight at night”. cant say anything till after dark, just got the bike today. danged sun, ruining half the fun of this thing… which of course half the fun will be playing with the light, ha ha. That is ONE Sweet ride weklund. Friend of mine has a red one, he won’t let it go. Whats the black round box on the rear? 6V? A 2S buck driver should drive quite a few LEDs quite nicely! 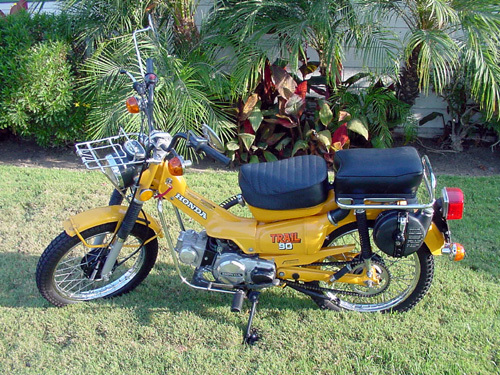 I had a yellow 1971 suzuki TS 90 when I was 14. On my 15th birthday I bought a 71 Yamaha DT 250.
but? this isn’t a real alternator, its one of those “magneto” things. That means the wiring is “primitive”. I haven’t taken my new METER to it yet?? but… by EYE looking at the brightness of the lights? or how quick the signals blink? took it out for a test spin at night finally? just to go get gas tank filled up, and pick up a few 2-stroke oil containers to have on hand? I didn’t make it ONE BLOCK before I was like “what IS that”??? and “it” was a DEER I honestly could not see it standing in front of me going 3 mph… I had to STOP and plug in the bike light… my boruit rj-02 has more “legs” than the main headlight on this thing. you have to put your hand in front of the headlight, even when moving? to “prove” its working. Have you looked at the lawnmower light thread ? I haven’t but it seems the issues addressed would be the same or similar. poor regulation ? / maybe a bad battery and it’s only doing part of it’s tesl job . Seems that the massive dimming issue was because although the battery was present .. it just was part of the problem instead of the solution ... that alone may be the easy solution .. but don’t adk me I haven’t played with bikes for a million years. Obviously heat and vibration are involved in failures of some of the modern cheapy led aftermarket or diy options . Then actually, a decent bike-light with a few ellipse TIR lenses, powered off a Li battery pack, would probably be the best bet. Otherwise, something usb-chargeable, and a pre-regulator that’d take anything on the bike’s voltage rails >5V and chop it down to only 5V, so that the usb-charger can recharge the cells as your hamster’s whirring away. the battery? I thought I was gonn just pop the seat and take my meter to it? uh uh…there are no TERMINALS tht I can see on the battery… just 2 wires coming out, and someone wired up what I thought were bullet connectors? no no no that would have made sense… its like they just perma-spliced into the battery wires. if I get adventurous, I will have to sample the voltage at a LIGHT somewhere after disassembling the light to get to the terminals. this puppy could use “all around” LED replacements, lol… be a nice winter project, anyhow. Wellp, in any electrical system, the battery is supposta be a “voltage sponge”. Limits voltage on the rails by sopping up excess voltage coming from the alternator/generator/dynamo/magneto/wotdahellever, and wrings out when needed to supply some upon demand. So if it’s fluctuating way too high and way too low, that means the battery’s shot, period. Oh, it’s possible it’s just barely connected through threads of rotted-out wire, supplying a “tickle” voltage under no load, but it’s way way way more likely an ancient battery is just internally fossilised and GFS. Spring for the bullet-connectors (or better yet, waterproof connectors from Amazon or the like), and Just Do It, like the teeshirt sez. I may be able to offer a little insight. I’ve had a 79 Kawasaki KE100 sitting in my barn for 30 years, pulled it out and got it in great shape and back on the road this summer. One of the most difficult parts of the revival was getting the lighting worked out. The KE electrical system is probably similar to your TS, a three coil magneto powers everything on the bike. One coil powers just the ignition, the battery is not involved in that circuit at all. One coil powers the headlight only, with AC voltage, more on that in a minute. 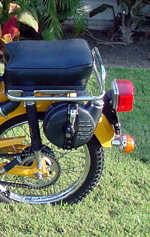 The last powers the directionals, tail lamp, brake lamp, horn and charges the 6V battery. Federal regulations required a street legal bike to have those items on a battery back then, not sure why the headlight didn’t have to be on it to. Once I got it on the road the first ride (at wide open throttle and a blistering 53 mph) I blew the high and low beams in the 40 year old seal beam headlamp. I found a 5 3/4”, 6V, H4 style headlight on Amazon with a 35/35 watt halogen bulb (the original was a 30/30 watt tungsten), I also purchased a 25/25 watt halogen H4 bulb. With the 35 watt bulb the lamp is very dim at idle to just dim at high rpm, voltage measures approximately 2V at idle to just under 5V at high rpm and remember, this is AC voltage. With the 25 watt bulb the lamp is acceptable at low rpm to “it’s about to blow” at mid rpm, voltage about 4V at idle to 8V or so when I let off the throttle. To save the cost of a regulator on the headlight circuit Kawasaki closely matched the load on the headlight magneto with headlamp wattage. Actually I’m sure they first figured out what wattage light was needed to be street legal and then built the magneto. When you check the voltage to your headlight remember it may be AC, also remember you need to check it under load (headlight plugged in). Also if you change the load as in going to LED your voltage will climb significantly. If your headlight circuit is straight off the magneto and unregulated you’ll probably fry the driver before your foot’s off the kick-starter (ever hold the spark plug cable on a lawn mower and pull the cord?). A quick way to check if your headlight is driven straight off the magneto is will it turn on if the engine is not running (off the battery)? If so it’s probably power by DC off the battery and your ahead of the game. My solution for the time being is keeping the 35 watt bulb in, once I’m over 50 mph I can kind of see ok.
Next issue was the directional, tail and stop lamps. All 6V incan bulbs, dim, slow to light and directionals flashed slow, particularly at idle. I swapped them all to LED, superbrightLEDs has a few 6V LEDs that fit with little modification but of course that led to a few other issues. Of course the LED directional bulbs don’t draw enough current to make the flasher work. I could have gone with resisters but I was trying to cut the loads down so the battery would remain charged. I found a 6V LED directional flasher on eBay but to install I had to re-wire the directional indicator in the speedo. Once that was done I turned on the key and everything worked great, directionals, brake light and tail light. I thought I was done until I started the engine. With the engine running the flasher went nuts. Directionals off, the indicator would flash erratically at times. When I turned on the directionals sometimes they flashed normal, sometimes erratic. Started testing with the volt meter and found my bikes simple, unregulated charging system isn’t very friendly to solid state components. The charging coil sends AC voltage to a simple rectifier (in this case just a single diode) then to the battery, no regulator. Since I’ve lowered the load with the LEDs as the revs go up the battery (and solid state flasher) are seeing more than 9V. And with the simple rectifier I’m sure if I pulled out the scope I’d see a significant AC ripple. I’ve added a 25v 2200uF capacitor to the power line to the flasher and the directionals are working ok now. I’ll figure out a better recitifier/regulator to keep the battery alive over the winter. As for the wiring on your battery, my 6V battery also has wires, positive is a bullet connector and negative is an eye. I bought a new battery and before I installed it I installed an SAE connector for a 6V battery tender. Sorry for the long post, just wanted to give you an idea of what you may be in for it you want reasonable lighting on an old 6V bike. I just love those Moto uh… SAE connectors.